Since joining Rotary First Harvest – a program of Rotary District 5030 (USA) in 2001, I have had the unique opportunity to help expand this program’s strategic impact at the local and national level. Through the dedicated efforts of hundreds of monthly volunteers, we’ve been able to quadruple the amount of produce collected and distributed annually. With the dual goal of reducing hunger and food waste, Rotary First Harvest connects farmers, truckers, food bank and volunteers to reduce hunger-related malnutrition. 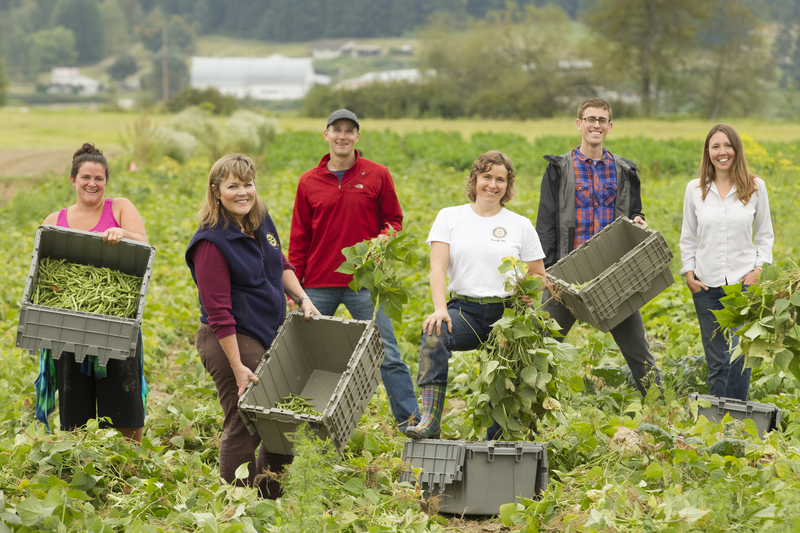 Rotary First Harvest is a program of District 5030 that connects farmers, truckers, volunteers and foodbanks to feed hungry families healthy food in Washington State. Core work: First, we find truckload-sized donations at large growers and packing houses. Next, we locate donated trucking to haul the produce to a distribution center where it is shared with local hunger relief programs. At each stage, Rotarians and Rotarian-owned businesses are directly involved. Harvest Against Hunger: To capture smaller donations from small and mid-size farms, Rotary First Harvest created a program that places AmeriCorps*VISTA (similar to Peace Corps) members in smaller communities. Those VISTA then connect local farms and gardens with hunger programs and volunteer groups to create thriving produce recovery programs. Through these partnerships, deep and sustainable connections are made that will deliver fresh produce to those in need well into the future. Rotary First Harvest is highly collaborative. We don’t duplicate services or resources. Instead, we find innovative ways to connect or improve existing efforts. We firmly believe in using our resources to transform the weakest link in the food chain into the strongest. 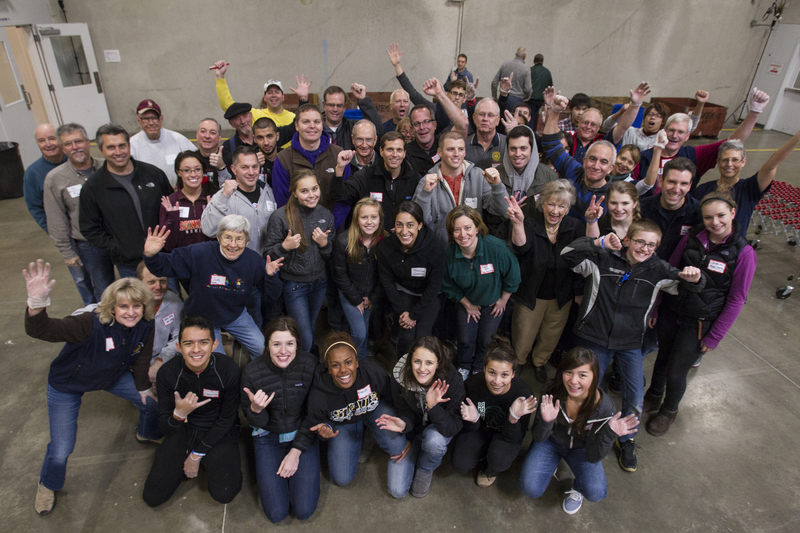 Over 143 Rotarians, Rotary Youth Exchange students, Rotaractors, Interactors and community volunteers celebrate packaging 47,000 pounds fresh produce in one day. This fresh food will be delivered to a local foodbank. Twice a month, Rotarians from across District 5030 invite friends and family to help repack some of the millions of pounds of apples, potatoes, carrots, peas and other items Rotary First Harvest receives in bulk. These work parties serve as a simple yet powerful example of Rotary activity in our community. Like any Rotary project, Rotary First Harvest started with one Rotarian (Norm Hillis) with a great idea for how to help others. Other Rotarians then provided their resources and expertise to help the idea grow and flourish. It’s a simple formula that continues to improve lives each and every day. Ethical dilemma: what would you do? World Food Day 2014: Feeding the World. Caring for the Earth. It is a very good thing to do,for our communities.We do have a need in our communities in Greece and of course in many other countries,because of the economic situation,that the countries are in.I believe it is very good idea to feed our people and prevent mulnitrition,which is the first step to sickness.In my opinion it is better and cheaper to feed our people,than to ask for hospitals and treatments .